She wrote back that she and her family had enjoyed a golden tree-topper of a Christmas. She had finished taking down her decorations and wrestling with the fairy lights. She noted that she was also wrestling with her major writing projects and all that goes with creating a new book. “My characters are so clever and mischievous. I think I know them and then they dart away and come up with a new plan,” she laughed (with emojis!). But I could sense some worry in her words, too. She was half-way through writing the prequel to her successful and lovely debut novel, You Can’t Go it Alone. Not a good time to lose your characters! “I wish you could come to Wales and help me find my characters,” Jessie said. A few minutes later she wrote back with more details about an armchair trip to Wales. 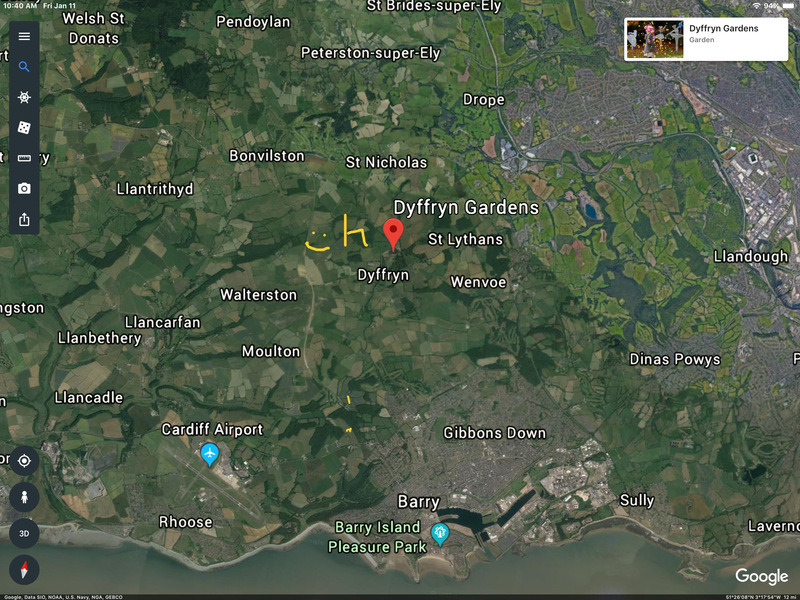 As all of you know, I am an avid armchair traveler (I have a lifetime of accumulated armchair frequent-flyer miles), so I put my recliner seat in a full tipped-back position and hurled off to Cardiff! I’ll let Jessie take over now! 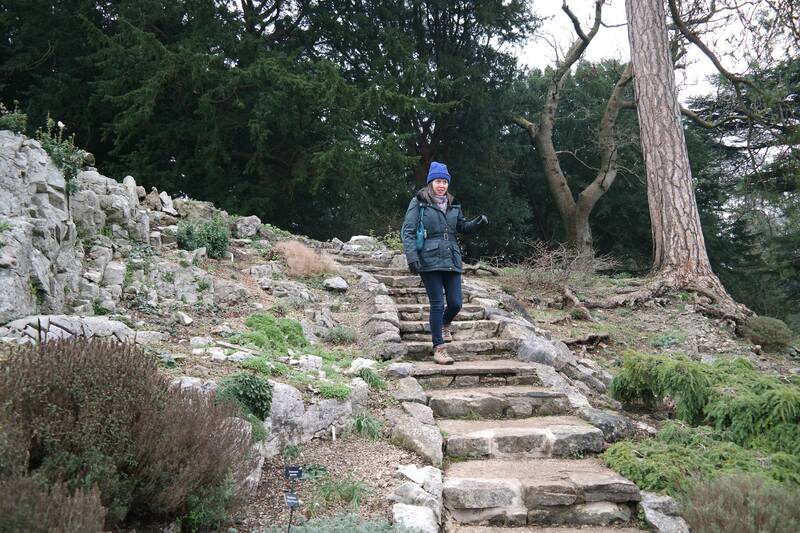 ‘Twas almost Twelfth Night when Jena challenged me to take her on a UK armchair adventure. 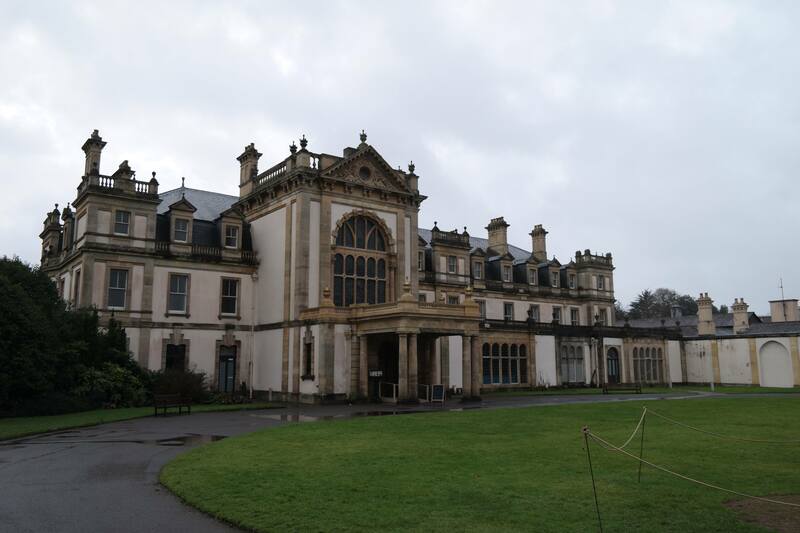 As a Downton Abbey fan, she loves British country houses, so I set off for Dyffryn House, near Cardiff. My driver chose the Audi as my carriage, because the Porsche was still in someone else’s garage. Jessie Cahalin is waiting for me! Where are book characters Luke and Rosa? Once I arrived, Jena called me and informed me I had to find Rosa and Luke from my novel. This couple’s love story features in You Can’t Go It Alone. Having read my novel, she wanted me to catch up with them, have a chat and warn them of a tragic event in the future. Jena was worried for their safety and felt I could save them. I did explain I had already started to write the prequel to this novel and was a little worried about tampering with the past. 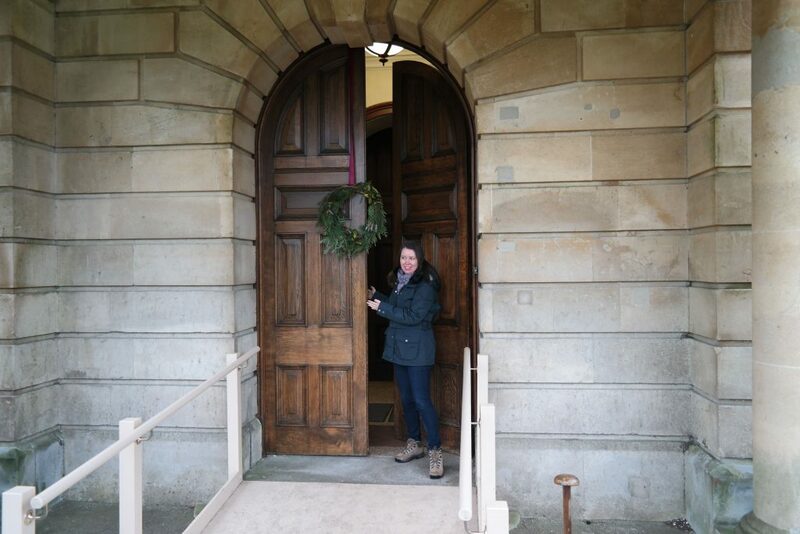 A warm, friendly woman opened the door to Dyffryn House. She had never heard of Luke or Rosa. When I contacted Jena via Messenger, she told me to search every room and the grounds. Apparently, she also required photos of the places I had explored. After ascending the grand staircase, I heard the door followed by footsteps. I looked over the balcony but there was no sign of anyone. It was so gloomy in the old place I decided to head for a lighter room. One of the bedrooms faces a symmetrical view of the garden that reminds me of an Italian garden. Perhaps Rosa would walk along the pathway. Alas, Rosa and Luke walked these paths two decades earlier in my novel. How could I look into the past? Grabbing my vintage binoculars, I scanned the garden for a sighting of the couple and magic happened. The garden had transformed to how it appeared in the nineties. 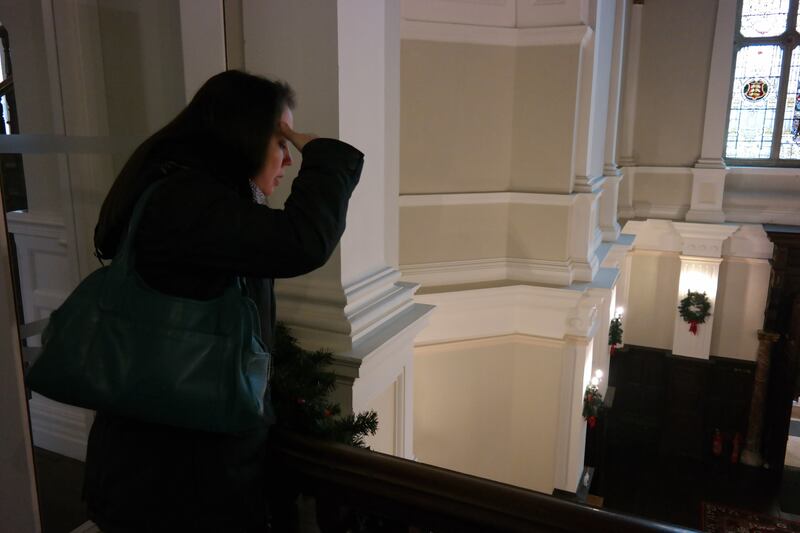 Jessie looks over the balcony- no sign of anyone! Having failed to spot the young lovers, I decided to settle down to read my book for clues. It amazes me how I live and breathe the characters for months but soon forget details of their lives. I walk into their worlds, let then guide me and am often sworn to secrecy. Reading the book prompted me to walk towards a tree where they probably had their picnic. Would they return? 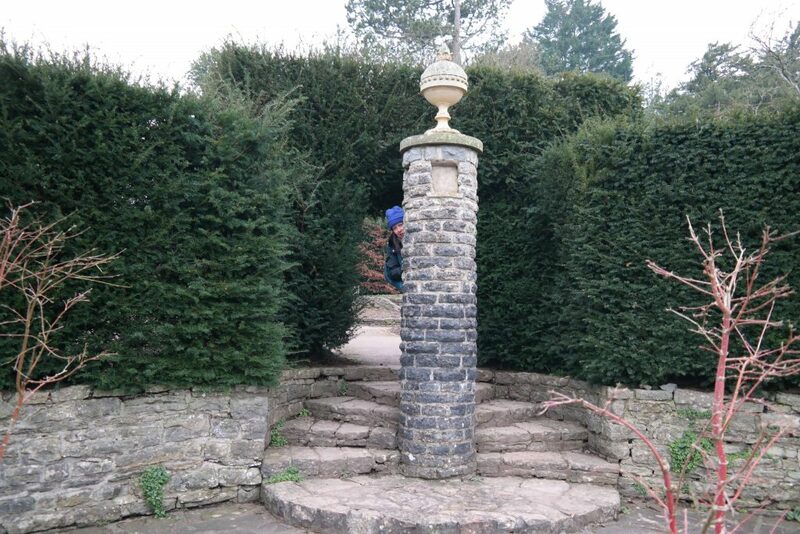 I stood alone for half an hour then heard voices in the walled garden, so I peered over the wall. A familiar conversation led me back into the world of the You Can’t Go It Alone. The sight of the house sparked Rosa’s imagination. ‘You could imitate the symmetry on a smaller scale,’ said Rosa. As she shielded herself from the sun, she recalled the stream of sunlight in Maria’s house yesterday. A clatter of rubble from the builders interrupted the silence. A huge tree announced a perfect spot for their picnic. Luke removed beef and onion sandwiches from a cooler bag, and Rosa spread a rug on the floor. They sat next to each other and the distance between them decreased. She liked the soft texture of freshly baked bread, and the thin slices of roasted beef but removed the large chunks of onion. ‘Here, this is for you.’ Luke handed a parcel to Rosa. She looked at the beautiful impressionistic paining of Villa D’Este gardens, in the hills above Rome. Brush strokes and textures of paint formed a vivid, haunting setting. ‘It’s beautiful. I can’t believe how you have captured the light. Did you paint this yourself?’ Taking the painting, she held it to her heart. The texture of the oil on the painting felt rough. ‘I will treasure this.’ She moved her face forward to his. Their lips almost touched but Rosa moved to kiss him on the cheek. Jessie: I had an epiphany. Having listened to the couple, I realised I could not go back and impact on their lives. However, in the prequel, I will meet Luke’s parents, Jim and Pearl. I have been surprised to discover Jim and Pearl knew Rosa’s parents. I can’t change Rosa and Luke’s sequence of events, but I can explore events that led to their lives. How did they learn to open their hearts to love? We can all reflect on the past, learn from our mistakes and make the future shine. Jena: Many thanks to Jessie- and her chauffeur for a delightful trip. 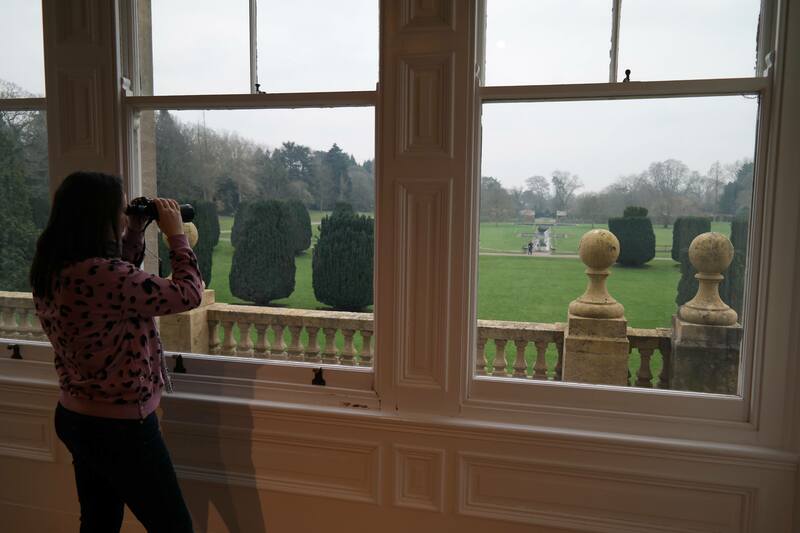 I visited a lovely stately home from my armchair and I also gained some insight in to how Jessie creates her marvelous characters and imagery in her writing. Time to roll out of my recliner! Jessie Cahalin plays with her characters and creates beautiful stories. I encourage you to get to know Jessie- she is warm, vibrant, positive and all-around fun! Jessie is a Yorkshire author living in Cardiff, Wales. Wales and words have a special place in her heart. 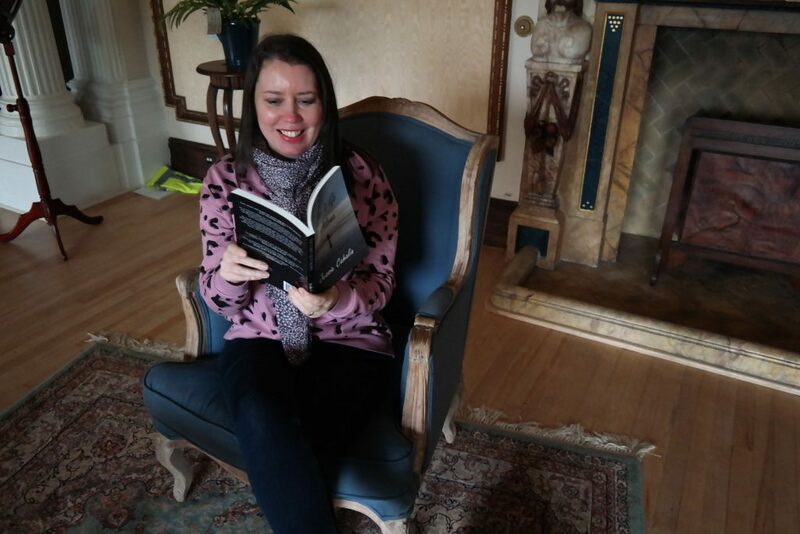 She loves to entertain and challenge readers with her contemporary fiction and wants everyone to meet the characters who’ve been hassling her for years. Set in Wales, You Can’t Go It Alone is ‘a novel with a warm heart’ and is the first book in a family saga. Jessie is also the innovator of the popular Books in Handbag Blog. Besides writing, Jessie adores walking, talking, cooking and procrastinating. Walking helps her to sort out tangles in her narratives or articles. She searches for happy endings, where possible, and needs great coffee, food and music to give her inspiration. Jessie enjoys connecting with her readers and would be delighted to hear from you. Indeed, the readers requested the prequel to You Can’t Go It Alone. I am delighted you have presented our adventure is such a fabulous post. Thanks for listening to my writing challenges and for helping me to find my characters. It was splendid to take you into their world. They had a great game of hide and seek but they are back on track. I couldn’t have found the road to my narrative without you. What a fun post Jena and Jessie. Looking forward to catching up with your characters. Thank you Brigid. I know you love to travel! This is such a delightful, smiley blog. How wonderful to be led up and down the paths, up and down stairs and to peer through the window in search of characters. I still have a smile on my face as I type. Thanks. Isn’t it interesting how we approach our work in such different ways? I can’t go anywhere without a notebook now. I need to capture ideas and sentences before they fly away. Wish you could have been there with us. Mavis and Dot may have been hiding in the tea rooms A notebook is also my trusty friend. Thank you Angela! I agree- writing consumes and captivated me. Stay Golden! We had a blast, Brigid. Thanks for your kind words. A lovely post that leaves me smiling! How better to blend the joy of armchair travelling and books. This is beautifully executed here and a delightful way to bring your characters alive, Jessie. Jena, I thoroughly enjoyed this … more please! Oh Annika- you’ve made me so happy! As you said, nothing like a good book and a comfy armchair to take us away! Lesley- thank you! You are right- book characters are so real to me and the things they come up with! It’s not authors who get carried away with names. I had to laugh the other day when a friend, who fell in love with my hero (Richard Duke of Carlisle) in Dangerous Entrapment, said, “I’ve just read a book and the hero was The Duke of Carlisle. I thought, oh no you are not. That’s my Richard and you’re not him.” I’m still laughing as I write this. You authors always come up with such imaginative and different blog posts. I really enjoyed reading this and it made meant to pick up YOU CAN’T GO ALONE and look at it a-fresh. I’m always sad when I say goodbye to my characters as we’ve come to know each other so well. Looking forward to seeing what you come up with next time. Thanks Lizzie! Ah the joy of writing and having fun- and our characters can certainly surprise us!